The Crucial Environmental blog provides everything you need to know about asbestos â€“ from frequently asked questions, to advice on what to do if you find asbestos in your home. As industry professionals with experience dealing with Asbestos in homes and businesses across Sussex, Surrey, London and Hampshire, you can count on the expert advice provided by the Crucial Environmental blog. This what your Crucial Environmental: Asbestos Specialists Blog Blog Ad will look like to visitors! Of course you will want to use keywords and ad targeting to get the most out of your ad campaign! So purchase an ad space today before there all gone! 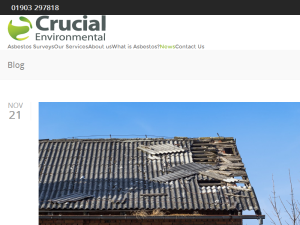 If you are the owner of Crucial Environmental: Asbestos Specialists Blog, or someone who enjoys this blog why not upgrade it to a Featured Listing or Permanent Listing?